So I met Scott from Vedavoo (www.vedavoo.com) at the International Fly Tackle Dealers Show in Vegas last month. We chatted for a few minutes and when I told him I was a sling pack kind of guy he suggested I try his out. I currently own an Orvis sling as well as a Patagonia so I was a bit skeptical to pony up for a third but his story was so darn compelling that I couldn’t help myself. As much as Vedavoo makes some pretty cool gear… I will get back to that shortly…. they truly embody the American spirit. All of their gear is hand sewn (many by the owner himself!) in America with all American made fabrics, buckles, lashings, etc…. If you have ever worked in a manufacturing environment (even a small one) you know that you can send this work over seas for a fraction of the price it costs to make it here. For this alone I tip my sun bleached truckers cap to Scott and his team. I love my country and if I can do my share to support our local economy then that is a band wagon I am more than willing to jump on! Ok, so it’s made in America, he is a fly fisher, boy scout, helps old ladies across the street, and is an all around nice guy… yada yada yada. How did you like the sling Mr. Brownliner? Don’t leave us hanging in suspense. OK… LOVE it. So much so that I gifted my other favorite gently used sling to CW as his had seen better days. Let me start with the basics. 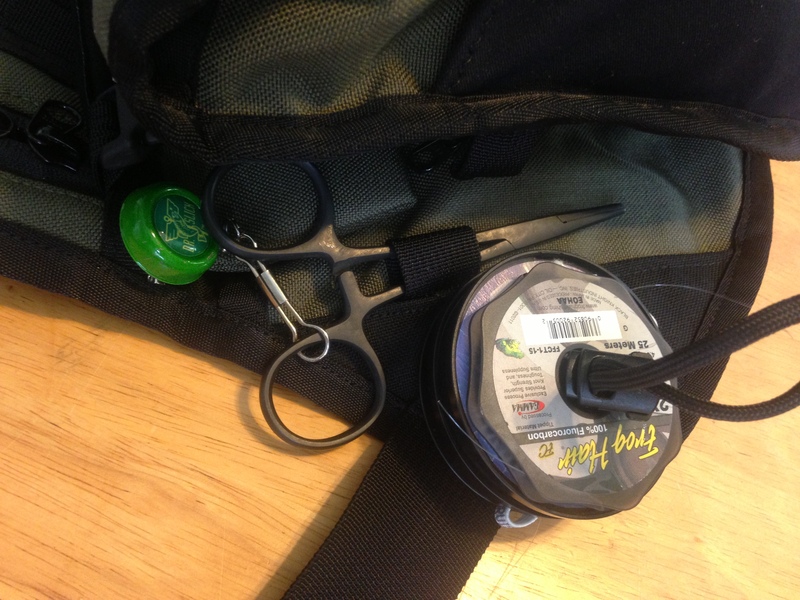 It sits perfectly in the small of my back when I’m fishing and is in perfect position when I slide it around front to change flies, tippet, etc… There are multiple ways to attach gear so it is a really flexible platform for those of you that are picky like me. 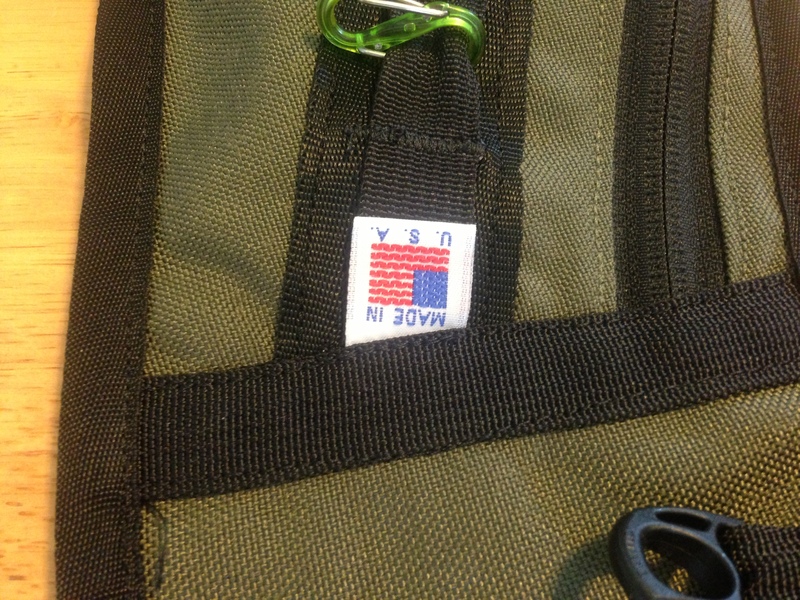 One of my pet peeves about slings or packs in general is that many times gear dangles and swings or is exposed. 99% of the time it is no biggie but it usually becomes a disaster when you get that one shot at the fish of the trip and you realize that your fly line is looped around your hemostats which were dangling from your sling! I found it pretty easy to make sure that there were very few situations where my tools would be in the way yet were very easy to access. 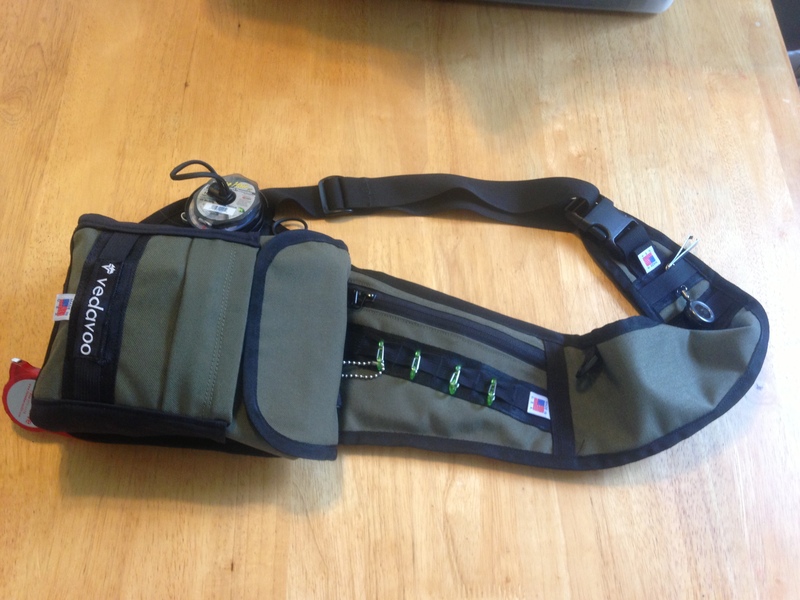 The aspect of the Tightlines Sling that I love the most is that appeals to my minimalist tendencies. 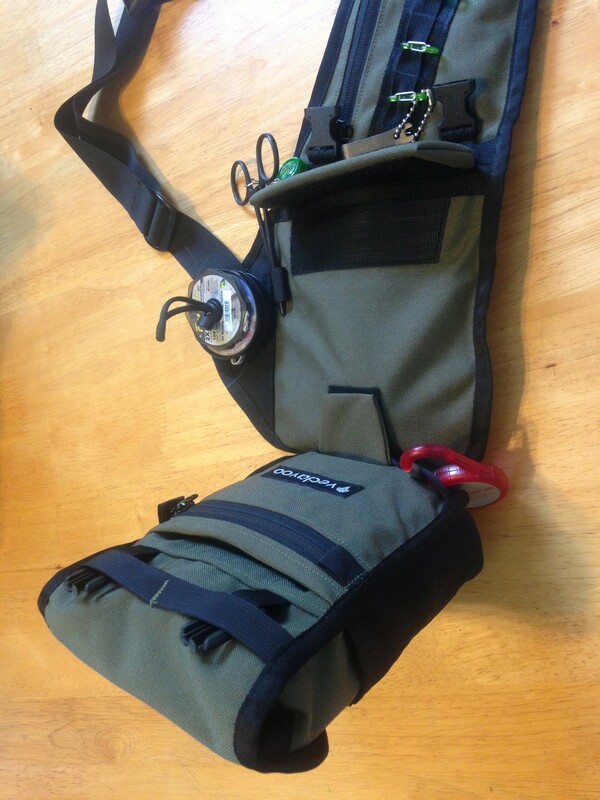 You can travel with the full deluxe pouch as pictured above, or remove the pouch and still use the sling for a light day on the stream, pond, etc… Accessing the different compartments is fairly simple as a few buckles hold the top of the pouch snug to the sling. The feature that I particularly liked was the tippet spool holder. Now for those of you that like to carry 0X through 7X this may not be your preference but I rarely carry more than 3 or four tippet spools at any given time and I loved how there were not dangling spools or protruding holders to deal with. The sling does not feature any molded compartments or fold down work stations and that is just fine with me as I have never been a big fan and don’t really use that sort of thing. The Tightlines Sling is an exercise in simplicity and clean functionality which really spoke to me. This is not a magnum sling or a guide pack. If you are looking for something to carry massive amounts of gear then this is not the right product for you. 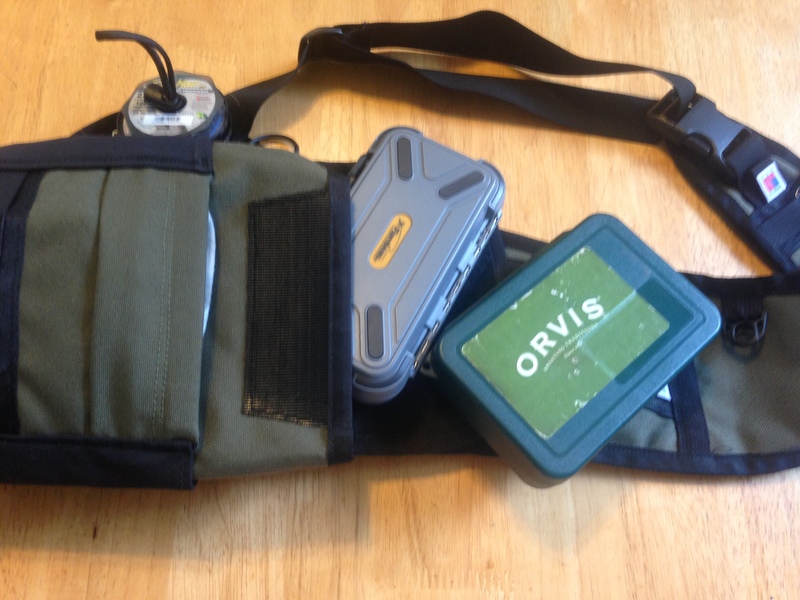 (Check out www.vedavoo.com for some larger capacity bags if that is your interest) I found the pack was perfect for carrying two good sized fly boxes and all the tools you would need for a basic day on the water. The only critique I would lay on the design would be the desire for an integrated water bottle holder or to have lashings on the bottom of the deluxe pouch or the sling itself to be able to add one. Nothing short of outstanding. Everything was well stitched and put together with attention to detail. I looked it over multiple times looking for some “hand made” flaw and I couldn’t find a darn thing. The folks at Vedavoo adorn all of their products with the red white and blue and this has been well earned.